As a Messenger for the Pleiadian Council of Light, I have several ways to share information and to teach people how to connect with their spiritual guides. 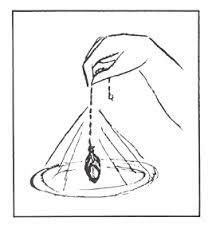 One way is through dowsing using a Pendulum. This is called Information Dowsing. Dowsers may use charts to receive more accurate information to identify energy. For example, I use a chart to measure percentages and levels when I dowse for non-beneficial energy in my food, drink, body, and home. This is extremely helpful in understanding subtle energies. My response is that many people have their own idea of what makes the pendulum move, and I have heard a few. However, the answer that I have received is this: The energy that moves the device is Original Thought from our higher mental body that permeates our entire being. Thought (mental energy) may move the pendulum directly without the physical body being in involved. Using a dowsing device with intention, helps you attune to your Christ Mind (the Christ Consciousness in you). As you develop your skill through regular practice, the force that moves the pendulum shifts from your Higher Mental Body (your Christ Mind) to that of your I AM Presence (your God Mind).